Remember package lockers the USPS began testing in 2011 that allowed shoppers to have packages shipped to them for pickup as an alternative to home delivery? 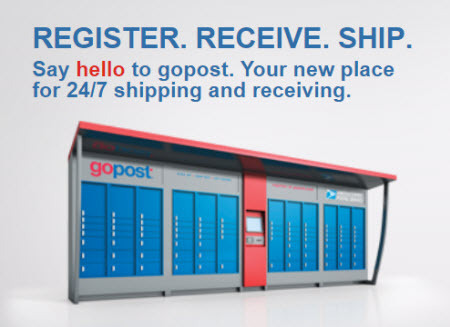 The Postal Service announced this week it’s expanding its “gopost” lockers. Despite the fact that porch thieves are alive and well, the USPS is only offering gopost lockers in a small number of states. We wrote about the USPS pilot program in January 2012 when they were first being testing in seven locations in Northern Virginia. This week, the USPS revealed it now operates gopost units in New York, New Jersey and Virginia, and it just opened a location in San Francisco in July. Small: up to 12″W x 15″D x 3″H. The USPS didn’t “invent” package lockers, and it has many rivals, including UPS (Access Points) and Amazon, which is now leveraging its Whole Foods Markets grocery store to house even more of them. Interestingly online sellers didn’t automatically embrace the concept when we wrote about Kinek’s locker service in late 2011, with sellers commenting from both the shippers’ and the recipients’ point of view. As the Amazon Monopoly grows, they have more influence over our government, whether it is individual politicians or the USPS. The USPS is making changes for Amazon’s benefit, but Amazon doesn’t pay. They just profit. The taxpayers pay, small and medium business owners pay, and Amazon will be telling the USPS what to do for them more and more. But they never pay for it! They just get the benefits. There is a reason that Amazon does not want the USPS privatized and costs cut. It is because if USPS remains connected to the government, then average Americans (including the poor) will pay for services that AMAZON benefits from. The rich will get richer.